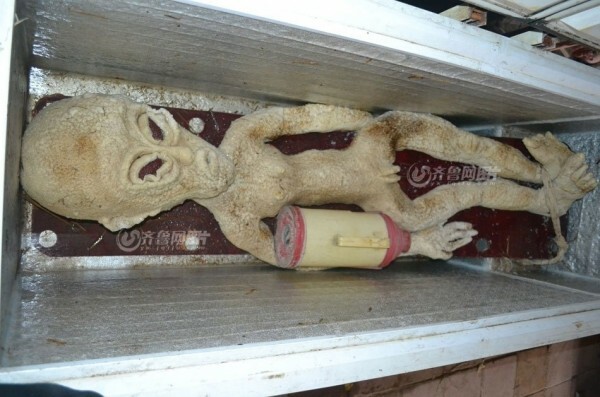 Alien Killed And Captured Then Covered Up By Chinese Govt To Look Look Like A Hoax, June 2013. 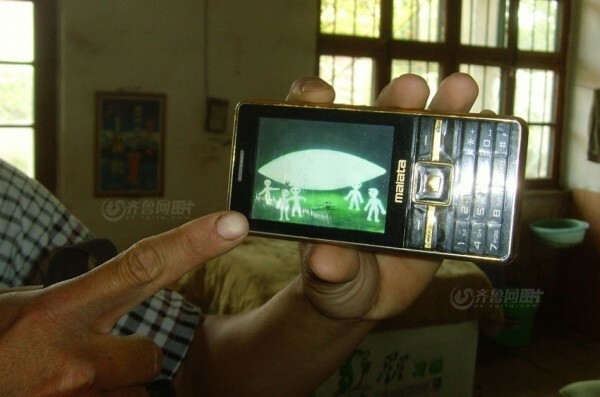 Recently, a man from Shandong Binzhou surnamed Li posted online claiming that, three months ago, he encountered five “aliens” in a flying saucer on the shore of the Yellow River. After electrocuting one of them to death, he hid it in his own warehouse. On the morning of June 10, after learning of the Li of Shandong Bincheng “electrocuted an alien to death” incident that has captured the attention of netizens, this reporter interviewed the Shandong Binzhou City Police. As it turns out, Li confessed himself that the alien was a fake, the material he used to make it being high-end rubber. This morning [June 10], Li was summoned by the Binzhou Police for questioning at the Binzhou Bincheng District Central Police Station. Previously, Li Kai claimed that, on the night of March 9, at about 2am, he went to the shore of the Yellow River to check the electrified wire netting he placed there for catching wild rabbits, never expecting that night would be different from other nights. On other nights, he would have caught several wild rabbits, but that night there wasn’t a single hare that had been electrocuted. As he checked, he felt a beam of light shining behind his back, turned around and was startled. “An unidentified flying object like a UFO was suspended above the shore of the Yellow River. I had no idea when my bicycle had gone under that flying saucer, and then five aliens came down one after another,” Li Kai told this reporter. Seeing this situation, he too was freaked out, but he still managed to take a photo with his cell phone. 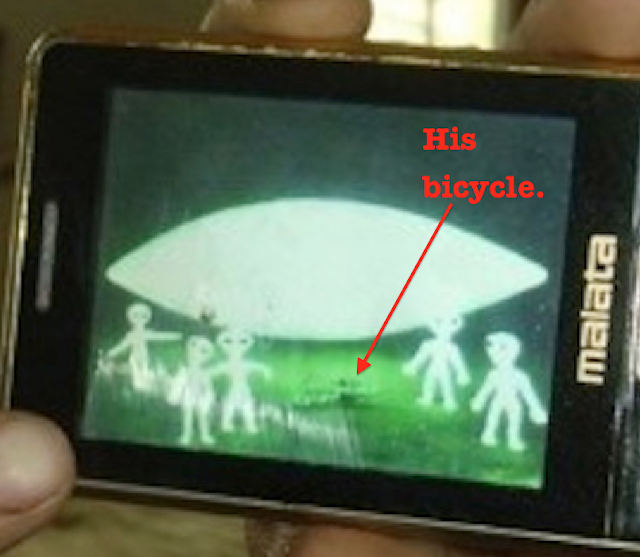 And just as he was taking the photo, he discovered his bicycle being sucked away by the flying saucer. Seeing this, Li Kai angrily picked up rocks on the Yellow River shore used for flood prevention and threw them. “The rocks shattered into small pieces”. Under attack, the aliens began chasing Li Kai. “The alien who was running in the front just happened to run onto the electrified wire netting and was electrocuted to death.” According to Li Kai, while he was running towards his home, he felt a flash of light flying to the north-west direction. “The other aliens went into the spaceship and flew away”. Li Kai said after he returned to his warehouse, he hurriedly barricaded the door to his home. 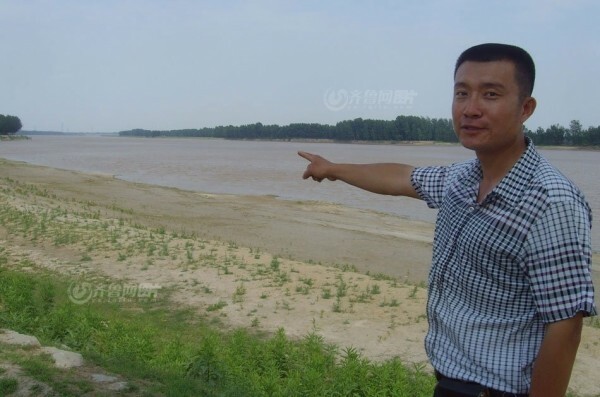 After seven to eight minutes without hearing a sound, the curious Li Kai wanted called to his neighbors to come with him to the Yellow River shore again but his knocking on their doors failed to wake the sleeping neighbors. So he had no choice but to bring along his big dog to embolden himself, and with a stick in his hand, he went back to the Yellow River shore alone. When he reached the river side, Mr. Li found that the alien lying face-down on the ground with its back to the sky. To confirm whether it was dead or alive, he poked it with his stick, and there was no movement, but then had his big dog sniff it to make sure it was indeed dead before he let his guard down. Then, he wrapped it with a blanket from his car and bought it back to his warehouse, and put it into the freezer. He wanted to call the police immediately, but both numbers on his cell phone had no signals, so he had to give up. According to Li Kai, he called the police immediately the next day. “After seeing the picture, the police told me to contact the relevant experts.” So, in the middle of March, Li Kai contacted an astronomy expert in Beijing. 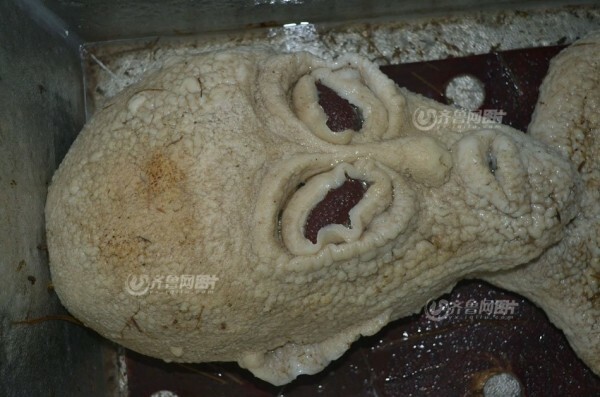 The expert from Beijing said he needed to take [the alien] back to Beijing in order to identify it, whereupon Li Kai said that he marked the alien and the two parties signed a confidentiality agreement whereupon the Beijing side would pay him a deposit in accordance with his demands and approximately at the beginning of May, the expert from Beijing would send the “alien” body back to Li Kai. After Li Kai verified that the “alien” was intact, Li Kai would return the deposit, and then both two parties would destroy the confidentiality agreement.